WHEELING, W.Va., Feb. 27, 2018 /Christian Newswire/ -- Legendary beauty queen, award winning actress, the first super model, and iconic cover-girl for 30 years with 50 feature films such as "The Summer of 42," plus 30 TV movies and three TV series to her credits, Jennifer O'Neill is back in the headlines with the "All That Glitters" conference that was held Feb. 24th in Wheeling, West Virginia to a sold out audience. The conference was a celebration for God's ladies and also featured the iconic actress from the hit TV series Matlock and St. Elsewhere, Nancy Stafford. Nancy was also a top model and a beauty pageant contestant in the Miss America Pageant. Stafford is a successful Christian author and international speaker. Also joining this amazing twosome was Gaither's Gospel Music Queen, Angela Primm. Primm is beloved by audiences world-wide and has become one of the most popular Christian music artists of the era. The conference was a huge success and a catalyst to revival spreading through-out the West Virginia, Ohio, and Pennsylvania areas as these three anointed ladies ministered through word, testimony, music, funny stories that brought laughter and then set captives free through inner healing and deliverance that left everyone in tears. 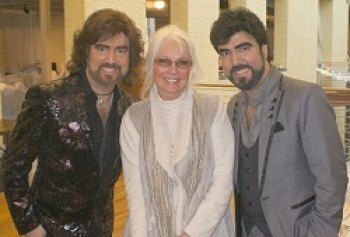 The conference was created by the famous Christian music duo, the Chrisagis Brothers. The Brothers created this conference because they had four great ladies influence their lives growing up, their sweet, beautiful mother, their grandmother, Jennifer O'Neill who they worked for throughout their 20's and 30's, and Christian music pioneer Stephanie Boosahda. They claim each lady shaped their lives and made them the men they are today. The Brothers say the owe a lot to these godly women and believe that if God gets women's hearts and lives, He will get the men and children's hearts and lives as well. It is true that the hand that rocks the cradle rules the world and will change the next generation. The conference is much like the Women Of Faith Conference but with more intimacy, and a personal one on one with the audience. It is filled with more of God's Word and has more heart for the women that come. The Brothers say women long for two things in life, a relationship with God and a relationship with another human being... a sisterhood, this conference meets both needs. The conference was designed like a special wedding of the Lord and His Bride, making each woman feel like a lady in royalty and femininity. They also celebrated Jennifer's 70th Birthday with seven cakes designed to capture a different time in O'Neill's successful life from her modeling to acting, to her ministry with veterans, her fight against abortion, and her inspirational life-changing books and speaking engagements. Jennifer O'Neill has proved time and time again to be one of a kind and one of God's end time generals for the kingdom. After Stafford and O'Neill gave an in-depth talk that brought inner healing and broke the blood-line curses off the ladies, a communion service followed that brought a bond of sisterhood to the group as the women shared communion with each other and Primm sang. The Brothers want to bring this conference to other areas, those interested should call 740-859-2344.